The Main Library, located in the Central Business District, opened in December 1958. The building, encompassing three main floors and two sub-basements, is the Library's flagship location, providing the system's largest collection of popular and research sources. The Main Library offers a wide collection of books, music, and movies, and hosts many programs for children, teens, and adults. Information Services, located on the first floor of Main Library, houses reference and circulating materials for adults. This includes Adult Literacy, African American Resource Collection (AARC), Large Print, Local History, Popular Fiction and Nonfiction, and World Languages. It also houses media collections of Audiobooks, CDs, and DVDs. The Division also provides 42 public computers; minimally-priced printing, copy, and fax services; a small meeting space; a large public programming space; and friendly and knowledgeable staff available to assist with checking in/out library materials, finding useful, accurate, and relevant information, using and understanding technology, and creating a space welcome to and respectful of everyone. The Youth Services division includes the Children's and Teens' collections at the Main Library. Youth Services houses Juvenile fiction, nonfiction, and audiovisuals, and Young Adult fiction. The Teen Zone also holds the Main Library’s graphic novel collection. Youth Services hosts Children’s storytimes weekly, and regular Teen programming every Saturday. Youth Services also provides seasonal programming throughout the year and welcomes visits by daycares, schools, and homeschooling groups. Call 596-2565 if you would like to schedule a visit. The Best Buy Teen Tech Center is an interest-based learning environment for teens to experiment and master various new technologies with help from their peers and adult mentors. They can then share their work with other teens across the globe through The Clubhouse Network. The center is equipped with technology and multimedia tools that can be used for music and video production, interactive programming, graphic design, and much more. Included within the Division's collections are books by or about Louisianians; city, regional, and state documents; manuscripts, maps, newspapers, periodicals, microfilms, photographs, slides, motion pictures, sound recordings, video tapes, postcards, and ephemera of every sort. The Louisiana Division also houses the City Archives, the official repository for the records of New Orleans municipal government (1769-present), and holds on deposit the pre-1927 records of the civil courts and the pre-1932 records of the criminal courts of Orleans Parish. Special Collections maintained by the Division are the Rare Vertical File, the Carnival Collection, the Louisiana Photograph Collection, the Map Collection, the Menu Collection, the Postcard Collection, the Manuscript Collection, and the Rare Book Collection. The Division's extensive Genealogy Collection contains books, periodicals and microfilms with emphasis on New Orleans, Louisiana, the Southeast United States, Nova Scotia, France, and Spain. YMCA Educational Services (YES!) is the adult literacy division of the YMCA of Greater New Orleans. YES! provides quality instruction to adults ages 16 and older in reading, math, and language. The goal is to give adults the skills they need to find better jobs, help children with homework, or effectively manage household finances. YES! serves adults who read at the 8th grade level or below. It is the only adult education provider in the area that focuses exclusively on serving these lowest-level learners. Located in the Bywater neighborhood, the Alvar Library was built by the WPA in 1940 and is a fine example of the Art Deco architectural style of that period. Weekly, we offer computer tutoring, storytime, and crafts. Collection highlights include locally-made comics and zines. 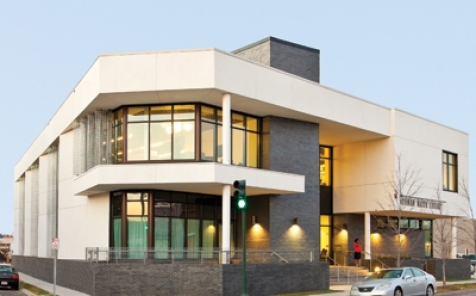 The Central City Library is located within the Mahalia Jackson Center and offers a wide collection of books, music, and movies, and hosts many programs for children, teens, and adults. The Children's Resource Center Library is home to a vast collection of juvenile and young adult materials as well as a small collection of adult items and hosts many programs for children, teens, and adults. The building is an original Carnegie Library, and has served as a public library since 1908. 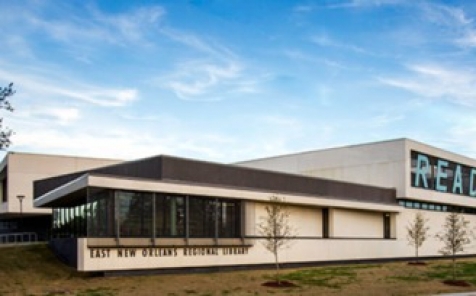 The East New Orleans Regional Library offers a wide collection of books, music, and movies, and hosts many programs for children, teens, and adults. 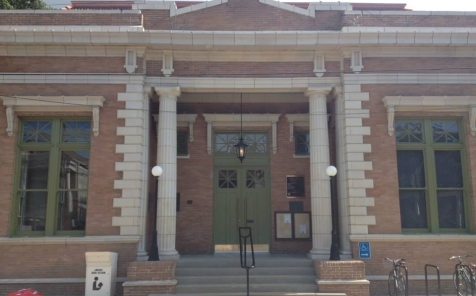 The library at 725 Pelican Avenue first opened on December 28,1907. 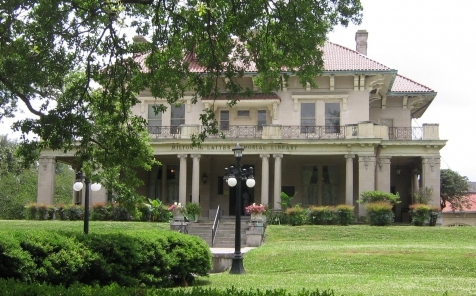 The Algiers Branch, as it became known, was one of five libraries in New Orleans established with money from Andrew Carnegie. Of those five libraries, only this branch and the Children’s Resource Center Branch are still in use as libraries today. On April 23, 1966, the Algiers Branch was closed due to deteriorating conditions of the building. In the early 1970’s, Cita Dennis Hubbell and other volunteers began a community action campaign to have the library repaired and renovated. 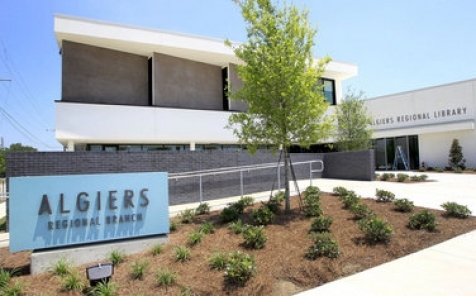 The campaign was successful and the library reopened as the Algiers Point Branch on October 14, 1975. After Mrs. Hubbell's death in 2001, New Orleans City Councilmember Troy Carter proposed renaming the library for her and it was rededicated as the Cita Dennis Hubbell Branch in 2002. On August 29, 2005, Hurricane Katrina devastated New Orleans and the New Orleans Public Library was forced to temporarily shut down. Fortunately, the Hubbell Branch escaped serious damage with only a few broken windows and some displaced roof tiles and The Hubbell Branch reopened October 31, 2005, only two months after Hurricane Katrina. 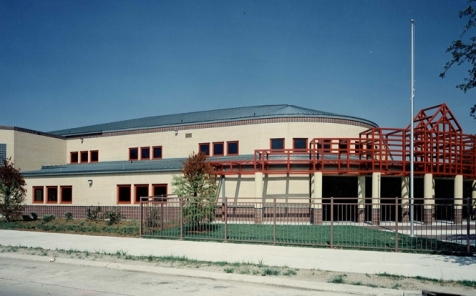 Although the Hubbell Branch made it through the storm intact there were structural concerns, even prior to Hurricane Katrina, about the building and once again the Hubbell Branch closed on May 24, 2008 for an extensive renovation. To ensure that the Hubbell Branch would reopen, Library users, friends, and neighbors of the Hubbell Branch began a community action campaign, similar to the one led by Mrs. Hubbell in 1975, to ensure the city would allocate the necessary funds to get the library repaired. This time the effort was led by Amy Hubbell, Cita Dennis Hubbell’s daughter. 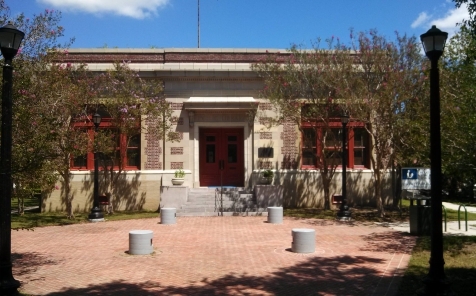 A temporary branch was opened in the Algiers Courthouse Carriage House to continue providing library services to the neighborhood until the renovated library opened. Now that the beautiful Cita Dennis Hubbell Branch library has been completely renovated and opened, it can continue its legacy as an integral part of this community and will always be cited as an inspiring example of the dedication and love this community has for their library. 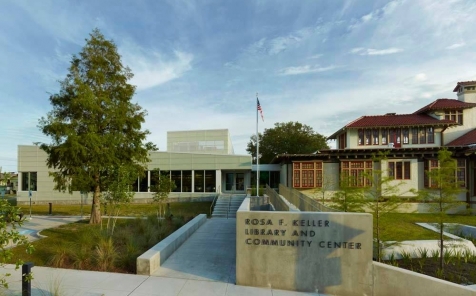 The Rosa F. Keller Library and Community Center is a partnership between the New Orleans Public Library and the Broadmoor Improvement Association which serves the Broadmoor community by providing residents with a gathering space for free programs, meetings, and valuable educational resources. The Rosa F. Keller Library and Community Center offers a wide collection of books, music, and movies, and hosts many programs for children, teens, and adults. For more than a century, our residential neighborhood has lived and thrived in the geographic heart of New Orleans. In Hurricane Katrina's aftermath with many questioning our community's survival, we rallied to become a model for disaster recovery. Today, our resilient neighborhood continuously works to improve the community through public education, improved health care, blight eradication, and a spirit of cooperation and commitment to make Broadmoor Better Than Before! The Dr. Martin Luther King, Jr. Library offers a wide collection of books, music, and movies, and hosts many programs for children, teens, and adults. The Milton H. Latter Memorial Library is located on St. Charles Avenue and serves the Uptown community. The 1907 neo-Italianate mansion was generously donated to the city by the Latter family to serve as a library in memory of their son. Today the branch offers programs for all ages as well as reading rooms, computers, printers, and wi-fi. Another popular draw are the Friends of New Orleans Public Library's book sales which take place on Wednesdays and Saturdays from 10am - 2pm in the home's former carriage house. The Norman Mayer Library offers a wide collection of books, music, and movies along with having a computer lab and fax services. There is a dedicated space for children with their own computers plus a space specifically for teens. The library also offers weekly programs such as storytime and weekly tech help in the computer lab. Additionally, the library hosts several adult programs such as a book club and adult coloring. The library is named for New Orleans businessman and one of the original Tulane College of Commerce and Business guarantors, Norman Mayer. 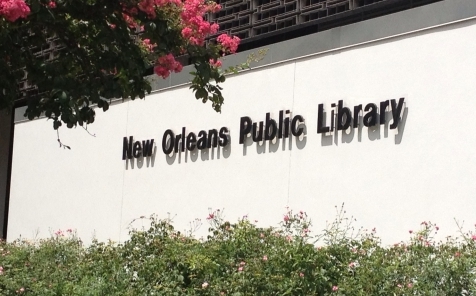 After his passing, his wife donated money to the New Orleans Public Library to have the library opened. Doors opened in 1949 and the library has been serving the Gentilly area since. The Nora Navra Library, originally called Branch Nine, opened in two temporary locations during 1946. The original permanent 2,500-square-foot building, located at 1902 St. Bernard Avenue, was dedicated as the Nora Navra Library on May 2, 1954. 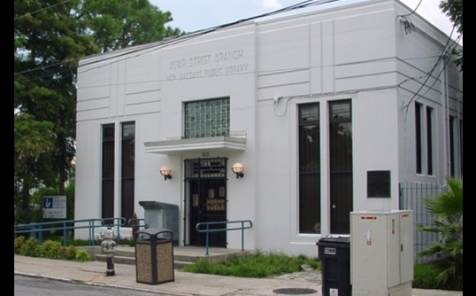 Branch Nine and the Nora Navra Library served the people of the Seventh Ward continuously for 69 years until it was destroyed by the aftermath of Hurricane Katrina. The destroyed building was demolished in 2017, and construction began on a new one. The celebration of the new 7,800 square foot building, held on Friday, August 24 and Saturday, August 25, 2018, marked the official reopening of all six of the Libraries that were damaged beyond repair by Hurricane Katrina. 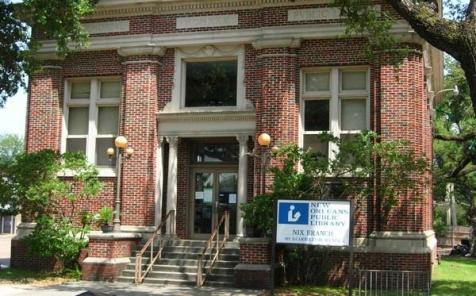 Opened in 1930, the Nix Memorial Library is located in the Carrollton neighborhood, two blocks from Oak Street and offers a wide collection of books, music, and movies, and hosts many programs for children, teens, and adults. 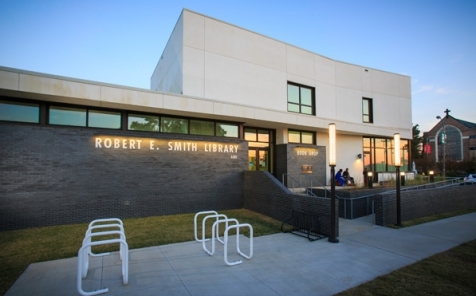 The Robert E. Smith Library offers a wide collection of books, music, and movies, and hosts many programs for children, teens, and adults.